Here in the Rocky Mountains, the aspen are turning bright gold and some are burgundy. They are truly magnificent against the turquoise Colorado sky. But the true mark of autumn is the Denver Gem and Mineral show, which just finished last Sunday. Though in reality I needed nothing, I cannot help going to see what Mark Lasater at The Clam Shell, Gary B. Wilson, Greg King-Falk Burger (the duo humorously known as “Burger-King”), Michael Hendrix and many more have in stock. They had less in stock after my friend, student and sister, Kathleen Krucoff, my students and I left. And remarkably, we do not fight over stones. We all have such different taste in our jewelry and colors that there is always plenty for all of us. Well, truthfully, Kathleen and I do tussle a bit over red jasper, Chinese Writing Stone, and petrified palm wood, but if you follow her blog, you know she is a purple lover, so she buys a lot more purples, while I go for the “earth tones”. (I’m such a child of the 70’s). As I predicted on my Tucson blog, Mark Lasater had some gorgeous Red Creek Jasper. Funny thing about names, it’s now called Cherry Creek Jasper, Cherry Creek Valley Jasper and just plain old Red Creek jasper. That’s the name the owner of the mine calls it, so I’m sticking with that until further notice. But there was a lot of it at the Denver show. Fall is also the time for the Castle Rock Art Festival. The gem show starts the Tuesday after the Castle Rock weekend, so I’m pretty exhausted. The Castle Rock show was pretty good for me this year, though not even comparable to “The Glory Days” of the 1980-90’s art festivals. But I had a great time and I always love meeting the other artists. This year I traded some work with my newest friends, fabulous wildlife watercolorist Stephen Koury from Lakeland, FL and metal artist Pamella Goff from Brighton, CO. Pamella makes diverse art from old spoons, and her pieces are totally delightful. Her spoon flower hangs in my kitchen. It reminds me of a delightful and spiritual sister. Stephen does these unbelievably realistic nature paintings, and my painting features a Harris Hawk and my favorite petroglyph, the “Moab Man”. It is being framed now, and I can’t wait to hang it in my entry hall. Both of these artists are so outgoing and wonderfully talented that it makes it the whole show experience pretty wonderful. Plus, the Castle Rock Festival is one of the best run I’ve ever participated in. They take such good care of their artists. Kathleen and I have decided that it’s easier to do some shows together so we are looking forward to doing more shows next year. Photo of me (on the right) with Kathleen (on the left) at the Castle Rock Festival this year. A few blogs back I expressed my feelings about galleries and shows, and thought something has to be done about the way we get our work out there, and yet allow us to do more than “break even” on an event. After some thought, I realized that what we need is a group of sincere artists who come together and present their work at a well-known, but non-gallery, location and perhaps start a tradition. Well, I’m very lucky to be on the Board of Colorado Metalsmithing Association (CoMA), so I took my idea to the Board, and they were receptive to trying something totally new. Previously, CoMA has only shown at galleries. Now we will have 28 artists, famous, notables, and emerging, those who answered our Call for Artists, and we will be showing and selling our work at the beautiful Denver Botanic Gardens on Oct 16 and 17. What is so amazing about this venue is that it is timed to take place along with the showing of Henry Moore’s monumental sculptures. It was Henry Moore who commented “The most powerful artworks are the largest and the smallest”. I was thrilled to find that quote, and we put it on our postcards. I would like to thank Kathleen Krucoff of Krucoff Studios for the design of both our poster and postcards. Everyone has commented on how stunning and professional they are, and it makes them proud to be a part of the show. So what I’m saying, along with please come see us at the show and sale, is that we, as artists, are creative people. If you are unhappy with shows and galleries, please take this idea and run with it. It’s nothing new, but it is a first for a great group of metalsmiths in Colorado. Look for willing locations in your area. Look for people who will help sponsor a show, and put one together. Is it a lot of work? Yes, tremendously so. Maybe a later blog will be a step -by-step of how to do this, but I’ve put together many shows in Texas and PA. All it takes is a spark, and you can ignite a whole group of people’s creative processes. Helping others get “out there”, in turn energizes me, and I feel a lot more creative. I hope you will come to see us. I can promise you it will be worth your time to see what these artisans have created and maybe you will find that right item and become a collector! 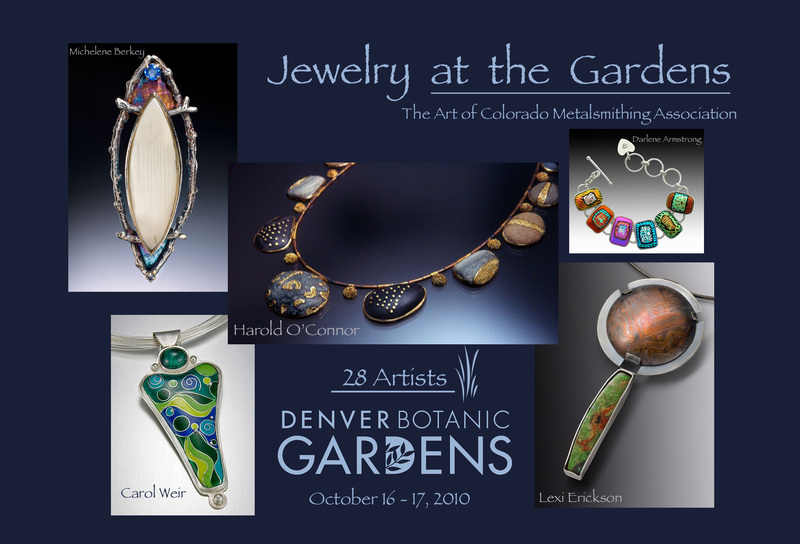 Show dates / times / location: October 16 ad 17, from 9 AM -5 PM, Denver Botanic Gardens, 1007 York Street, Denver Co, 80206. 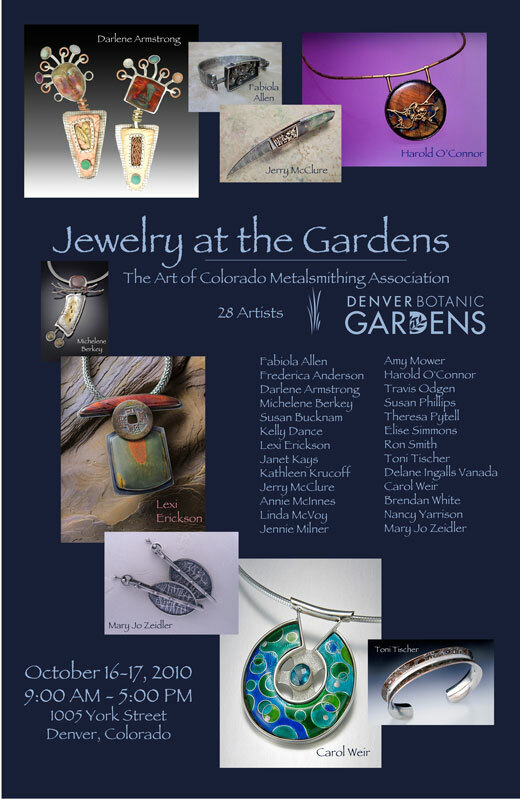 I’m off to create something for this “New Tradition”– I look forward to meeting you at this new event, “Jewelry at the Gardens”. Please mention you read about it in my blog as I would love to know. Thanks. Whew! This past week has been such a whirlwind of activity. Though I really enjoy the hustle and bustle of this time of year, it’s good now to sit back and relax for a few weeks before beginning another big adventure. 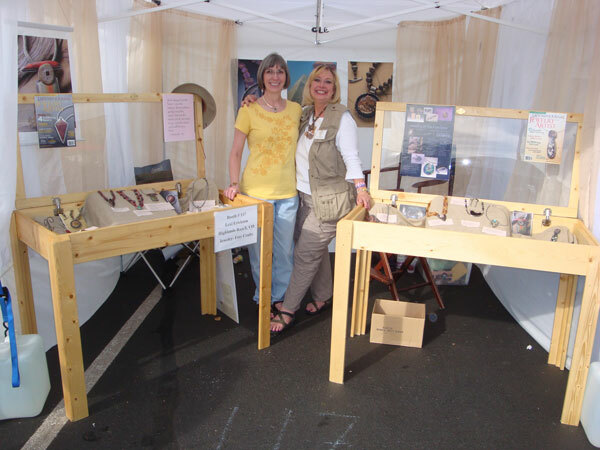 First, last week-end was the Castle Rock Artfest, in the neighboring town of Castle Rock, CO. I had visited this show for many years, and the quality of the work was amazing. There are 175+ excellent artists in the show. I always found many things that inspired me, and always made at least one large purchase. This year I decided to apply. I made it. I was thrilled. Saturday was a good day, and I made several large sales. Kathleen and Dan Krucoff came to visit and offer best wishes, and I saw several other friends and former students. But about 3:30 the sky opened up and it poured, the wind started, and the temperature dropped to about 47 degrees. We all closed up at 5:00. I came home and filled the bath with the hottest water available, and while my body thawed, I contemplated if I would ever do another show. Sunday dawned beautifully. Another day in Paradise. About 10:30 the entourage of judges walked down my aisle, and stopped and told me they were glad I had participated in the show. As I was responding what an honor it was to be in the show, one of the judges pulled out a “Best of Fine Crafts” ribbon, presented it to me, and proceeded to say the nicest things to me. Everyone applauded. I WAS IN SHOCK! Then she handed me a check, too. I was speechless. I’m not often speechless. This is the first big show I’ve done in over 10 years. You would have been so proud of me when the radio station interviewed me and I couldn’t remember where I live! Am I suave and sophisticated or what? But I cannot express what a thrill it is to hang a ribbon like that over your work. My things are very different, totally one of a kind, and all hand done. My inspirations, as you have read on my website, are my adventures and travels during my years in archaeology. My pieces are not beautifully carved stones with diamonds, gold and platinum. (In fact, at the Philadelphia Buyer’s Market of American Craft, what we call “The Rosen Show”, one lady actually looked at my stuff and said “Yuck!”) There were many wonderful jewelers at Castle Rock. Not only this, the glass, wood, and ceramics artists had fabulous pieces, both in design and craftsmanship. There were so many outstanding artists, and I congratulate each of them, also. Their work is inspiring and beautiful. I am deeply, deeply honored the judges chose my work. I thank you each from the bottom of my heart. What a feeling!!! I’m already scoping out shows for next year. So I guess what I say to you all is “Go For It”!!! You don’t know what the judges will be looking for. Work from the heart, do what you love. And most of all, don’t compare your work to anyone else’s. As Julia Cameron says in “The Artist’s Way”, “Leap and a net will appear”. The next day, Monday started the Denver Gem and Mineral show. WOW! Sensory overload. This show takes up 2 hotels lobbies and ballrooms (plus 3 stories of show rooms on each floor), circus tents in the surrounding parking lots, the enormous Merchandise Mart and Annex, the Denver Western Stock Show Complex, and another hotel out at the airport. I try to do some pre-show appointments because its easier to buy on a one-on-one basis than on the showroom floor. I bought almost exclusively from the 4 cutters I previously mentioned. This year I added Greg King, from Taos , NM to my list of cutters. I bought from him years ago, and still buy from him when I go to Taos Gem and Mineral. He had gorgeous ocean jasper and dino bone. After so many years of walking this show, I know just about where everything is, and it takes days to see all of it. I walked the entire show this year, partly to see if anything was new. Also, if my students asked where anything was, I could point them in the right direction. Believe me, when all my friends and students arrive, and we go to the show together, it’s like herding cats. For us, it’s a huge social event…running into friends we haven’t seen for a year, standing the aisles, our arms around each other, sharing what we’ve bought, ohhhing and ahhhing, moving on 3 feet away and seeing another group of friends, sharing,…you get the picture. Mark and Christa Lasater (The Clamshell) had the most fantastic chrysacolla I’ve ever seen. Ka-ching. And gorgous amethyst sage. Ka-ching. Of course Gary B.Wilson had some neat new jaspers. As I’ve never met a jasper I didn’t like, I bought several. (Several????) He has a Cobra Jasper that is orange and yellow…fabulous. More Ka-ching. These two cutters are real artists in stone, they never fail to amaze me. Their stuff really melts my solder! There was a lot of shiny stuff from Asia, pre-made jewelry, African beads, rare trilobites with all these tendrils in matrix, ammonites, mammoth tusks, gold nuggets, emeralds, cool tools, and many things I cannot afford. Something for everyone. Lots of vendors had some fabulous new dark red beads, that when the light shines on them, they look like red velvet, Fabulous. Ka-Ching. The fun was hanging with my friends and students, the Lapidary Journal staff and writers, and Colorado Metalsmithing Assoc. friends, both during the show and after. My friends and I got to bed each night between 2 and 3 AM, and the alarm went off at 6 to start again. Thank goodness the week is over! Please consider joining us next year, or if you can do it earlier, try for March, 2010, for Beadfest in Santa Fe. I’ll be there, just in case I have left one stone unturned! I’m off to take a nap. Thank you, everyone, for the wonderful welcome. I’ve had a great time reading your responses. I’m still learning how to do this, not being a computer oriented person, but again, Kathleen has been wonderful. If you ever get to meet her in person, your life will be greatly enriched. Those of you wanting to learn to solder, I hope we will be able to help you. If you live in or visit the Southwest US, I’ll be teaching soldering at the Lapidary Journal’s Jewelry Artist Beadfest in Santa Fe in March. Please come join us. As you look for stones, you may find a beautiful specimen, and you may be swept off your feet with the colors and patterns in the piece. You may not think about the actual shape of the stone. Later, in your studio, when you get ready to design with it, you find it’s difficult and bulky to design around. These guys cut stones with us, the artists, in mind. 1. If you only buy stones you fall madly in love with, you will never sell those stones. (And how would I know this?) If you can, purchase 2 of them, one for you and one to sell. This works for beads, too. 2. Don’t forget to buy small stones, even though they may not knock your socks off, you need small accent stones, especially if you are working at 3 AM and realize you suddenly need a 4mm black onyx to finish the piece. Have a small supply on hand, always. 3. Make sure the stone is flat on the bottom if you are doing a cabochon set. Stones with a curved bottom will never set right..
4. If you are a beginning stone setter, stick with rounds and ovals. Squares will take more practice. Those with very sharp points, though beautiful, will be difficult, and you may break off the point. Save those for when you are more advanced at bezelling. 5. Don’t shy away from large stones. They make stunning focal pieces, usually worn up high on a simple neck wire or omega chain. Watch what is being worn by the women news announcers on TV. They only have a small area in which to show jewelry, and its usually a gorgeous necklace that just shows under a collar. 6. You may have your own organizational techniques, but I put my stones in Riker boxes, the glass topped flat boxes, and group them according to the cutter. That way, if I need another Chinese Writing Stone, like I recently did, you have them grouped with all those from the same cutter, so you can call him and ask for more. The quality and the finish will be consistent with others you have. I hope these ideas have helped you with stone selections, and hope you get to go to some fabulous gem shows and find treasures. If I learn how to post photos I’ll send pics of the Denver Show. Kelly Bly is flying out from PA. She’s one of my students from PA, and still flies out to have fun and deplete her checking account. Several writers from Lapidary Journal are coming. We will all meet and share our goodies, have a cold adult beverage, “ooooh and ahhhh” over each other’s finds, and then rush off to buy more. So this is an open invitation to you all to come visit the Denver show. There are 8 different locations in north Denver, and shuttles between venues. And if we’re standing at The Clamshell, fighting over the same stone, tell me who you are. I’ll be happy to let you add it to your collection.